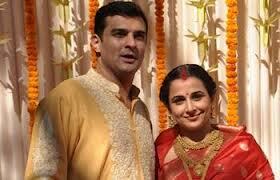 Bollywood Actress, Entertainment, Siddharth Roy Kapur, Vidya Balan, Vidya Balan marries Siddharth Roy Kapur. The wedding, a mix of Punjabi and Tamil traditions, was attended by the families of the bride and groom. Balan, 34, has played the lead in many hit Bollywood films and won several Indian cinema awards for her acting. Mr Roy Kapur is the CEO of UTV Motion Pictures, India's leading film and television production company. The wedding festivities began on 11 December with a private dinner which was followed by a mehendi (henna) ceremony on 12 December. The couple are due to host a reception in the southern city of Chennai. Balan has acted in Hindi, Bengali and Malayalam language films. She made her Bollywood debut with the 2005 film Parineeta and went on to act in the superhit Lage Raho Munnabhai. Tags # Bollywood Actress # Entertainment # Siddharth Roy Kapur # Vidya Balan # Vidya Balan marries Siddharth Roy Kapur. Vidya Balan marries Siddharth Roy Kapur. Labels: Bollywood Actress, Entertainment, Siddharth Roy Kapur, Vidya Balan, Vidya Balan marries Siddharth Roy Kapur.